VERVIERS, Belgium -- Intelligence sources told CBS News on Friday that a manhunt was underway in Belgium for three individuals believed to have been trained by the Islamic State of Iraq and Syria in Syria, as dozens of suspects were rounded up in that country and two others following the deadly attacks in Paris last week. A dozen people were arrested in overnight in anti-terrorism raids in the Paris region, targeting people linked to a gunman who attacked a kosher supermarket and claimed ties to ISIS. Spokeswoman Agnes Thibault-Lecuivre for the Paris prosecutor's office said the arrests began overnight and continued in three towns Friday morning. Interior Minister Bernard Cazeneuve said 12 people were arrested in the early morning raids, most of them on non-terrorism related offenses. 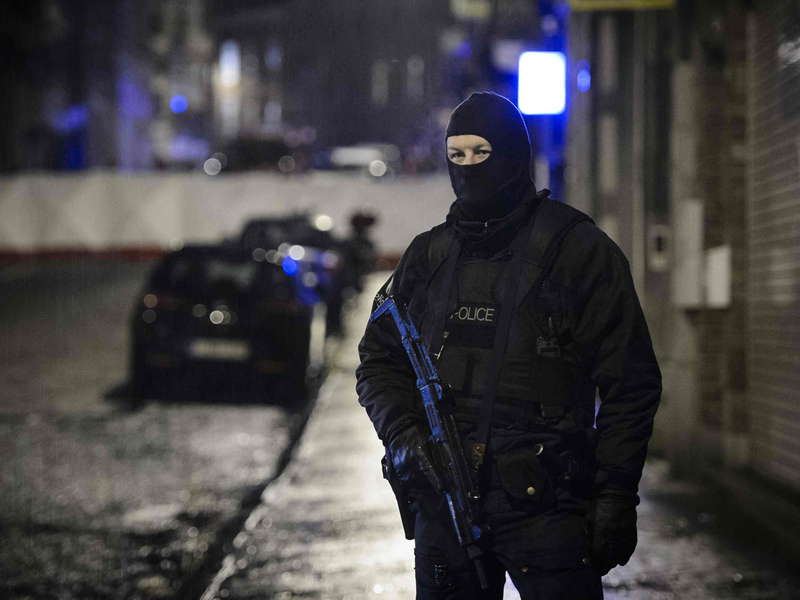 Authorities were on high alert in France and neighboring Belgium, where authorities moved swiftly Thursday night to pre-empt what they called a major impending attack, killing two suspects in a firefight and arresting a third in a vast anti-terrorism sweep that stretched into the night. Speaking Friday morning, Belgian Federal Magistrate Eric Van der Sypt said a total of 13 people had been arrested since the raids began in three cities across the country. He said in the raid on the primary location in the eastern city of Verviers, where the two suspects were killed, 4 Kalashnikov assault rifles, several smaller fire arms, ammunition, explosives and several police uniforms were found, along with false documents, communications equipment and cash. Van der Sypt said the suspects "had the intention to kill several policemen in the streets." He said several of those arrested had been "fighters in Syria, but I can't give you exact details or numbers. I can't give you anything more about the identity of suspects either, or nationalities, because of the investigation." Van der Sypt said two people were also arrested in Paris in relation to the investigation in Belgium, but it was not immediately clear whether those individuals were included in the 12 arrests confirmed earlier Friday morning by the French Interior Minister. The two people arrested in Paris were Belgian nationals, according to Van der Sypt. He added that there were no known links between the people arrested and the alleged plot to attack police in Belgium and the attacks last week in Paris. Meanwhile, Berlin police said they had taken two men into custody on suspicion they were recruiting fighters and procuring equipment and funding for ISIS in Syria. The two were picked up Friday morning in a series of raids on the German capital involving the search of 11 residences by 250 police officers. Authorities said the raids were part of a months-long investigation into a small group of extremists based in Berlin. The group's leader, identified only as 41-year-old Ismet D. in accordance with privacy laws, is accused of organizing the group of largely Turkish and Russian nationals to fight against "infidels" in Syria. The other suspect, identified as Emin F., 43, was accused of being in charge of finances for the group. In an unrelated raid, police in Wolfsburg, about 120 miles west of Berlin, took a 26-year-old German-Tunisian dual national into custody on suspicion he had fought in Syria for ISIS in 2014. Police said there was no evidence any of the suspects were planning attacks inside Germany. Also Friday, police in Ireland arrested a suspected French-Algerian militant at Dublin Airport as he tried to enter the country using a false passport. The man, who was being interrogated, landed on a European watch list after expressing support in social media for last week's attacks, authorities said. In London, British police arrested an 18-year-old woman at Stansted Airport on terrorism offenses after she arrived on a flight. London's Metropolitan Police didn't say where the flight originated. The unidentified woman was held in a central London police station on suspicion of preparation of terrorist acts and being a member of an illegal group, the police said. The Paris prosecutor's office said Friday's raids around the French capital were linked to Amedy Coulibaly, one of three gunmen involved in France's worst terrorist attacks in decades. Coulibaly died in a police raid on a Kosher grocery store in Paris a week ago, after killing four hostages. Authorities in France and several countries are looking for possible accomplices. Did French police miss all the clues? In an arrest separate from the raids on Thursday evening, Belgian police detained a known arms dealer who turned himself in Thursday morning and confessed to being in touch with Coulibaly. The man was being held on arms trafficking charges. It remained unclear whether the man sold weapons to Coulibaly, but a U.S. law enforcement source told CBS News that Coulibaly is believed to have purchased weapons in Brussels allegedly used in the attack on the grocery store. Coulibaly took out a loan for about $6,000 to purchase weapons, including scorpion machine guns and Tokarev handguns he obtained in Brussels. In addition Coulibaly is believed to have bought the Kalashnikov and other weapons used by Said and Cherif Kouachi in their attack on the office of the Charlie Hebdo newspaper in Paris on Jan. 9. Meanwhile, a French national with alleged links to one of the brothers agreed Friday to be extradited to France. A Bulgarian district court decided to extradite 29-year-old Fritz-Joly Joachin to his home country, but Joachin has three days to decide whether to uphold his decision. Joachin's defense lawyer, Radi Radev, told the AP that his client will uphold his decision to be extradited and wants to clear his image before a French court as soon as possible. Al Qaeda's branch in Yemen, known as AQAP, has claimed it planned and funded the attack by the Kouachis, but links between the brothers and Coulibaly appear to be down largely to their friendship rather than any serious coordination. "Paris really was a wake-up call because it was a demonstration that these fighters who are going abroad, whether it's to Iraq, Syria, Yemen or elsewhere really do pose a threat," CBS News terrorism analyst Juan Zarate said Friday on "CBS This Morning." "I think to the extent that these individuals are flowing into Syria and Iraq, they are making connections with and potentially training with groups like the Islamic State, also al Qaeda-related groups like Jabat al Nusra. And so it's very possible that these are individuals that are well-trained, funded, perhaps even directed to go back and attack," said Zarate. "I think what authorities are most worried about now," said Zarate, a former White House counterterrorism adviser, "is that Paris really is an accelerant; that this is now motivating those who may or may not have been directed by foreign terrorist groups to now attack in place. And that's why you see this aggressive counterterrorism activity around the continent." On Friday morning, U.S. Secretary of State John Kerry visited the kosher store, and then the former Charlie Hebdo office to show solidarity with the French after the attacks. The Obama administration has admitted that a decision not to send any senior official to Paris immediately after the attacks, to join about 40 other world leaders who showed up to show their support, was the wrong move. "I think it's fair to say that we should have sent someone with a higher profile to be there," White House Press Secretary Josh Earnest said on Monday.